Grab the popcorn as the London Short Film Festival kicks off this week for a veritable feast of cinematic treats. Now in its ninth year, the LSSF is bigger and better than ever with its own trailer and around seventy events over eleven days of interest to the public, film geeks and creative professionals alike. If you want to try something different, head down to Straight8's "Silent Disco" show next Tuesday which will show 20 films simultaneously, allowing the audience to choose which they watch through wireless headphones, or go old school at Hackney Picturehouse Attic this Sunday where Screen Bandita will celebrate analogue cinema with an amalgam of abandoned Super 8s and antiquated Russian gramophones. Kino London, the monthly open-mic film night which has helped bring to life audience-generated ideas, has been mentioned on Londonist before. This month they're putting the pedal to the metal and aiming to 10-12 filmmaking teams all shooting new shorts to be shown as part of LSSF on 12 January. If you're interested, get yourself to Vibe Live this Saturday for their lunchtime Production Meeting. There will also be specialist events focussing on the Occupy London Stock Exchange, disability in film, young urban filmmakers and the winners of the Underwire Awards dedicated to the works of women film professionals. London-based filmmaker Alex Sufit is again in the running for the festival's Music Video Award. Last year, she won the same award for "Bad Penny" with "bawdy wench" and drag king Ophelia Bitz. Sufit's effort this time around is a toe-tapping take on 1920s East London for jazz Top Shelf Jazz. 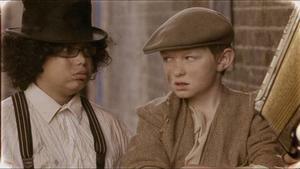 The Bugsy Malone-inspired video features the Enfield-born Dexter Fletcher and accordionist-about-town Tom Baker (aka squid-faced crooner HP Lovebox) and a bunch of cute kids. Full information on the London Short Film Festival can be found on their official website. If music videos are your thing, you may also be interested in entering your own for next month's BFI Future Film Festival.